※St. Ignatius puts the focus on every scene of the Passion in contemplating on the Passion of Christ. Here is the specific way to contemplate on two early scenes. In this method, it is instructed that most parts are done in the same way, except the [First Prelude] through the [Third Prelude], which are done differently. The two contemplations (the first and second contemplations) are originally done separately, but they are put together here for the sake of convenience. The following is the side-by-side description of the first two contemplations. The first Prelude is to bring to memory the narrative; which is here how Christ our Lord sent two Disciples from Bethany to Jerusalem to prepare the Supper, and then He Himself went there with the other Disciples; and how, after having eaten the Paschal Lamb, and having supped, He washed their feet and gave His most Holy Body and Precious Blood to His Disciples, and made them a discourse, after Judas went to sell his Lord. The second, a composition, seeing the place. It will be here to consider the road from Bethany to Jerusalem, whether broad, whether narrow, whether level, etc. ; likewise the place of the Supper, whether large, whether small, whether of one kind or whether of another. The third, to ask for what I want. 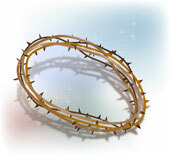 It will be here grief, feeling and confusion because for my sins the Lord is going to the Passion. The first Prelude is the narrative and it will be here how Christ our Lord went down with His eleven Disciples from Mount Sion, where He made the Supper, to the Valley of Josaphat. Leaving the eight in a part of the Valley and the other three in a part of the Garden, and putting Himself in prayer, He sweats sweat as drops of blood, and after He prayed three times to the Father and wakened His three Disciples, and after the enemies at His voice fell down, Judas giving Him the kiss of peace, and St. Peter cutting off the ear of Malchus, and Christ putting it in its place; being taken as a malefactor, they lead Him down the valley, and then up the side, to the house of Annas. The second is to see the place. It will be here to consider the road from Mount Sion to the Valley of Josaphat, and likewise the Garden, whether wide, whether large, whether of one kind, whether of another. The third is to ask for what I want. It belongs to the Passion to ask for grief with Christ in grief, anguish with Christ in anguish, tears and interior pain at such great pain which Christ suffered for me. The first Point is to see the persons of the Supper, and, reflecting on myself, to see to drawing some profit from them. The second, to hear what they are talking about, and likewise to draw some profit from it. The third, to look at what they are doing, and draw some profit. The fourth, to consider that which Christ our Lord is suffering in His Humanity, or wants to suffer, according to the passage which is being contemplated, and here to commence with much vehemence and to force myself to grieve, be sad and weep, and so to labor through the other points which follow. The fifth, to consider how the Divinity hides Itself, that is, how It could destroy Its enemies and does not do it, and how It leaves the most sacred Humanity to suffer so very cruelly. The sixth, to consider how He suffers all this for my sins, etc. ; and what I ought to do and suffer for Him. It is to be noted, as was explained before and in part, that in the Colloquies I ought to discuss and ask according to the subject matter, that is, according as I find myself tempted or consoled, and according as I desire to have one virtue or another, as I want to dispose of myself in one direction or another, as I want to grieve or rejoice at the thing which I am contemplating; in fine, asking that which I more efficaciously desire as to any particular things. And in the way I can make one Colloquy only, to Christ our Lord, or, if the matter or devotion move me, three Colloquies, one to the Mother, another to the Son, another to the Father. ※ In the course of continuing contemplation on the Passion, St. Ignatius asks us to apply internal and spiritual five senses as continued from the contemplation on incarnation. Follow the detailed description in section  as to how to apply the five senses.